Premium Protein Blend (Whey Peptides, Whey Protein Isolate, Whey Protein Isolate 97%), Whey Protein Concentrate, Cocoa (Processed With Alkali), Soy Lecithin, Salt, Natural And Artificial Flavor, Gum Blend (Cellulose Gum, Xanthan Gum, Carrageenan, Dextrose), Silicon Dioxide, Acesulfame-Potassium, Sucralose. Mix 1 scoop with 5 oz. of cold water or skim milk in a glass or shaker cup. Use between major meals and before and after exercise. Read the entire label before use and follow directions provided. Do not use if pregnant or nursing. Consult a medical doctor if you have a medical condition or before starting a diet or exercise program. Premium Protein Blend (Whey Peptides, Whey Protein Isolate, Whey Protein Isolate 97%), Whey Protein Concentrate, Natural And Artificial Flavor, Soy Lecithin, Gum Blend (Cellulose Gum, Xanthan Gum, Carrageenan, Dextrose), Salt, Silicon Dioxide, Sucralose, Acesulfame-Potassium. Contains milk and soy ingredients. Processed in a facility that also processes wheat, peanut, tree nut, egg and shellfish ingredients. (Whey Peptides, Whey Protein Isolate, Whey Protein Isolate 97%), Whey Protein Concentrate, Natural and Artifical Flavors, Soy or Sunflower Lecithin Caramel Color, Gum Blend (Cellulose Gum, Xanthan Gum, Carrageenan), Silicon Dioxide, Sucralose, Acesulfame-Potassium. Contains milk, peanuts and soy ingredients. Premium Protein Blend (Whey Peptides, Whey Protein Isolate, Whey Protein Isolate 97%), Whey Protein Concentrate, Cocoa (Processed With Alkali), Peanut Flour, Natural And Artificial Flavor, Soy Lecithin, Salt, Gum Blend (Cellulose Gum, Xanthan Gum, Carrageenan), Silicon Dioxide, Acesulfame-Potassium, Sucralose. Mix 1 serving (1 scoop) with 6 oz. of cold water or skim milk or mix 2 servings (2 scoops) with 12 oz. of cold water or skim milk in a glass or shaker cup. Use between major meals and before and after exercise. Read the entire label before use and follow directions provided. Do not use if pregnant or nursing. Consult a medical doctor if you have a medical condition or before starting a diet or exercise program. Discontinue use and consult a medical doctor if you experience unusual symptoms. Premium Protein Blend (Whey Peptides, Whey Protein Isolate, Whey Protein Isolate 97%), Whey Protein Concentrate, Natural And Artificial Flavors, Soy or Sunflower Lecithin, Salt, Gum Blend (Cellulose Gum, Xanthan Gum, Carrageenan), Caramel Color, Silicon Dioxide, Sucralose, Acesulfame-Potassium. Premium Protein Blend (Whey Peptides, Whey Protein Isolate, Whey Protein Isolate 97%), Whey Protein Concentrate, Calcium Carbonate, Soy Lecithin, Cookie Crumbs (Rice Flour, Sugar, Cocoa (Processed With Alkali), Tapioca Starch, Palm Oil, Corn Starch, Natural Flavors, Salt, Sodium Bicarbonate, Soy Lecithin), Natural And Artificial Flavor, Salt, Cocoa (Processed With Alkali), Gum Blend (Cellulose Gum, Xanthan Gum, Carrageenan, Dextrose), Silicon Dioxide, Acesulfame-Potassium, Sucralose. Premium Protein Blend (Whey Peptides, Whey Protein Isolate, Whey Protein Isolate 97%), Whey Protein Concentrate, Natural And Artificial Flavors, Soy or Sunflower Lecithin, Caramel Color, Gum Blend (Cellulose Gum, Xanthan Gum, Carrageenan), Salt, Silicon Dioxide, Sucralose, Acesulfame-Potassium. Premium Protein Blend (Whey Peptides, Whey Protein Isolate, Whey Protein Isolate 97%), Whey Protein Concentrate, Natural And Artificial Flavor, Soy Lecithin, Gum Blend (Cellulose Gum, Xanthan Gum, Carrageenan, Dextrose), Calcium Carbonate, Malic Acid, Silicon Dioxide, Acesulfame-Potassium, Sucralose, FD&C Red No. 40. Premium Protein Blend (Whey Peptides, Whey Protein Isolate, Whey Protein Isolate 97%), Whey Protein Concentrate, Natural And Artificial Flavors, Soy or Sunflower Lecithin, Salt, Gum Blend (Cellulose Gum, Xanthan Gum, Carrageenan), Silicon Dioxide, Sucralose, Acesulfame-Potassium. Contains milk and soy ingredients. Processed in a facility that also processes wheat, tree nut and egg ingredients. Premium Protein Blend (Whey Peptides, Whey Protein Isolate, Whey Protein Isolate 97%), Whey Protein Concentrate, Cocoa (Processed With Alkali), Natural And Artificial Flavor, Gum Blend (Cellulose Gum, Xanthan Gum, Carrageenan), Soy or Sunflower Lecithin, Silicon Dioxide, Acesulfame-Potassium, Sucralose. Premium Protein Blend (Whey Peptides, Whey Protein Isolate, Whey Protein Isolate 97%), Whey Protein Concentrate, Cocoa (Processed With Alkali), Natural And Artificial Flavor, Salt, Soy or Sunflower Lecithin, Gum Blend (Cellulose Gum, Xanthan Gum, Carrageenan), Silicon Dioxide, Acesulfame-Potassium, Sucralose. Premium Protein Blend (Whey Peptides, Whey Protein Isolate, Whey Protein Isolate 97%), Whey Protein Concentrate, Natural And Artificial Flavors, Soy or Sunflower Lecithin, Gum Blend (Cellulose Gum, Xanthan Gum, Carrageenan), Acesulfame-Potassium, Sucralose, Silicon Dioxide, FD&C Blue No. 2, FD&C Red No. 40. Premium Protein Blend (Whey Peptides, Whey Protein Isolate, Whey Protein Isolate 97%), Whey Protein Concentrate, Natural And Artificial Flavors, Gum Blend (Cellulose Gum, Xanthan Gum, Carrageenan), Cocoa (Processed With Alkali), Cookies Pieces (Rice Flour, Tapioca Starch, Palm Oil, Cocoa (Processed With Alkali), Corn Starch, Salt, Chocolate Liquor, Natural Flavor, Sodium Bicarbonate, Soy Lecithin), Soy or Sunflower Lecithin, Acesulfame-Potassium, Sucralose, Silicon Dioxide. Premium Protein Blend (Whey Peptides, Whey Protein Isolate, Whey Protein 97%), Whey Protein Concentrate, Calcium Carbonate, Soy Lecithin, Cookie crumbs (Rice Flour, Sugar Cocoa (Processed with alkali), Tapioca Starch, palm old corn starch, natural flavors, salt cocoa (processed with Alkali), Gum Blend (Cellulose Gum, Xanthan Gum, Carrageenan, Dextrose), Silicon Dioxide, Acesulfame Potassium, Sucralose. Premium Protein Blend (Whey Peptides, Whey Protein Isolate, Whey Protein Isolate 97%), Whey Protein Concentrate, Cocoa (Processed With Alkali), Soy Lecithin, Salt, Natural And Artificial Flavor, Gum Blend (Cellulose Gum, Xanthan Gum, Carrageenan), Silicon Dioxide, Acesulfame-Potassium, Sucralose. Premium Protein Blend (Whey Peptides, Whey Protein Isolate, Whey Protein Isolate 97%), Whey Protein Concentrate, Natural And Artificial Flavor, Soy Lecithin, Gum Blend (Cellulose Gum, Xanthan Gum, Carrageenan), Salt, Silicon Dioxide, Sucralose, Acesulfame-Potassium. For over 20 years, NITRO-TECH has been a leading protein brand. Built on a foundation of human research and cutting-edge science, it has earned the trust of countless consumers worldwide. Now the same research and development team has pioneered a new formula based on superior protein sources, quality and manufacturing. 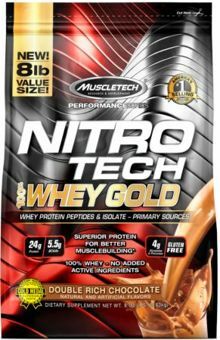 Introducing NITRO-TECH 100% WHEY GOLD – a pure protein formula featuring whey peptides and isolate! 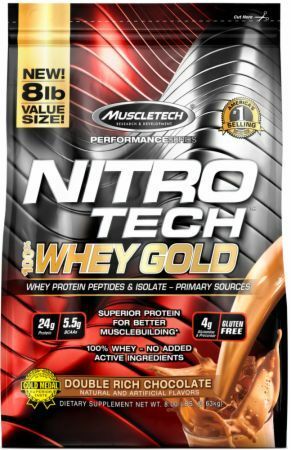 Each bottle of NITRO-TECH 100% WHEY GOLD is fully disclosed to guarantee you are getting the exact amount of real protein displayed the label – each and every scoop contains the full amount of protein stated on the label and is 100% real protein! Cookies and Cream This is a Buy 1 Get 1 FREE offer! Double Rich Chocolate This is a Buy 1 Get 1 FREE offer! Dulce de Leche This is a Buy 1 Get 1 FREE offer! French Vanilla Creme This is a Buy 1 Get 1 FREE offer!